This year’s rating showed 128 stallions producing at least one foal shown in 2014 Futurities, which was down from 2013 when 154 stallions produced at least one foal shown. However, the rating starts off with the same three stallions topping the list, as Undulata’s Nutcracker, Winsdown Westinghouse, and The Last Don have for a remarkable five years running. Westinghouse took the top spot in 2010 and 2011, while The Last Don made the number one spot in 2012 and 2013. This year was Nutcracker’s turn. The biggest mover on the chart was Absolute Evolution coming in at 4th for his first appearance on the rating. There were other newcomers as well, including #12 Undulata’s Heir Apparent, #13 Sir Of York, #16 I’m First, #18 Mountainview’s Heir To Fortune, #24 Coal and #25 High Point’s Ivory Coast. It is always interesting to note the relationships between the sires on the list as there are usually many connections, and this year was no exception. Santana’s Charm sired three stallions to make the rating – #10 Sir William Robert, #21 Charmed And Bewitched and #22 My Royale Charm. Sir William Robert himself also sired three stallions on the rating – #13 Sir Of York, #14 HS Daydream’s Dignity and #19 MBA’s Sir William Blue. This makes a huge influence for Sultan’s Santana, the sire of Santana’s Charm as well as #16 Gypsy Santana; eight of the stallions on the rating are directly connected to Sultan’s Santana on the tale male line. Another stallion CF First Night Out also sired two stallions on the list – #15 First Night In and #16 I’m First. The oldest sire to make the list was #16 Gypsy Santana, and the youngest #23 MBA’s Manhattan’s Shooting Star, born in 2010. The stallion with the most number of foals showing was the horse in our top spot, #1 Undulata’s Nutcracker with 26. Alternatively, the stallion with the least number of foals showing was #24 Coal, with one foal. Nutcracker also has the most total get, with a whopping 625 foals registered to date. The stallion with the least total get is #23 MBA’s Manhattan’s Shooting Star with just three foals registered to date. This year only one broodmare family was represented by multiple stallions. Two stallions – #1 Undulata’s Nutcracker and #15 First Night In – trace to Ruxer Farm’s incredible BHF Judy O’Lee. All the other stallions trace to individual female families. You can tell a Nutcracker baby easily – they are high-headed and charismatic and, at horse shows, are usually taking the victory pass. 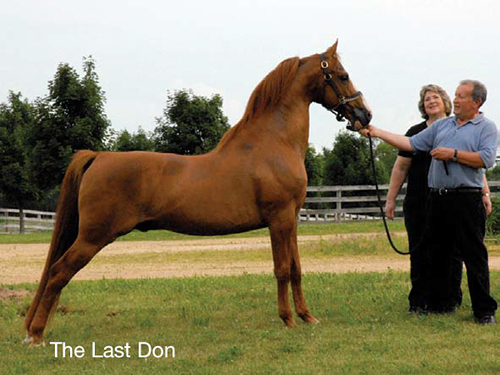 Since his first baby hit the ground in 2005, Nutcracker has quickly built himself a reputation as a sire of champions, and has undoubtedly secured himself a place in Saddlebred history. Gaited World’s Grand Championship in 1976 with Redd Crabtree. Nutcracker is out of Christmas In New York ERB, whose great grandsire was yet another Five- Gaited World’s Grand Champion, the incomparable CH Yorktown. He has sired champions in every division, from five-gaited, three-gaited, park and fine harness to show, country pleasure and western pleasure – and spurred the show world to explore every possible play on words involving the “nut” theme from his name. Reading a list of his get is like reading a “Who’s Who” of today’s show ring champions, and the futurity division is no exception. Though he may be a different color, Winsdown Westinghouse is carrying on the legacy of his famous sire, the grand Winsdown Hi Octane, who topped the Futurity Sire Rating for a stunning nine years. Rather than Hi Octane’s unique grey color, Westinghouse is a lovely bright chestnut with a flaxen mane and tail and lots of chrome, but he is siring the same beautifully conformed offspring with great feet, straight legs and wonderful dispositions. Westinghouse’s story is a special one, as he survived a broken leg and double pneumonia all in his first week of life, but his remarkable will to live pulled him through. 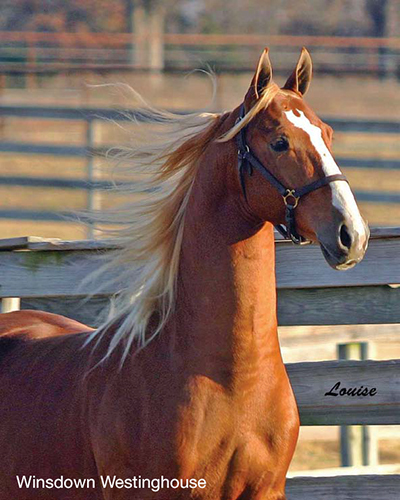 Though his injury prevented him from ever reaching the show ring, Westinghouse was able to thrive in his role as a breeding stallion, and became the youngest stallion to ever top the Futurity Sire Rating in 2008. This remarkable young stallion is owned by the Louise C. Gilliland Trust, and is out of Harbor’s Natural Light. The #1 stallion for the last two years, The Last Don makes his 13th appearance on our Futurity Sire Rating in the third position. This impressive stud is owned by Hickory Knoll Farm and is by Blazing Fire – by Hide-A-Way’s Firefly Supreme and out of the Broodmare Hall Of Fame mare, Look Of Love – and out of Telemark’s City Girl. A futurity and then five-gaited champion himself, he consistently sires bold, big-moving horses that have made their mark in the show ring, particularly dominating the park pleasure division with their good looks and manners. His 2014 crop of foals hit the futurity classes strong again this year. Making his first appearance on the list, impressively in the #4 spot, is Absolute Evolution. World’s Grand Champion Sultan’s Santana and CH Courageous Admiral. 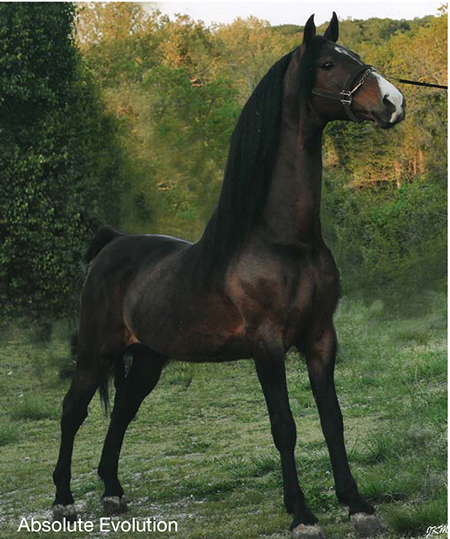 This bay stallion stands at 16.3 hands and has been passing on his beauty and size to his get, along with his same great attitude, topline and athletic ability. Since John has owned him he has sired three foals, each out of a different mare, and each has become a show ring champion: Absolut With A Twist is by the Winsdown Hi Octane mare, Better Angel, and won the All American Cup Weanling championship in 2012, Cool Cat Daddy, out of the Catalyst mare, My Flashy Flaxen, took reserve in the same class the following year, and Kiss Me Kat, out of the Ultimatum mare, The Ultimate Cat, took ninth out of 45 entries in the class this year. 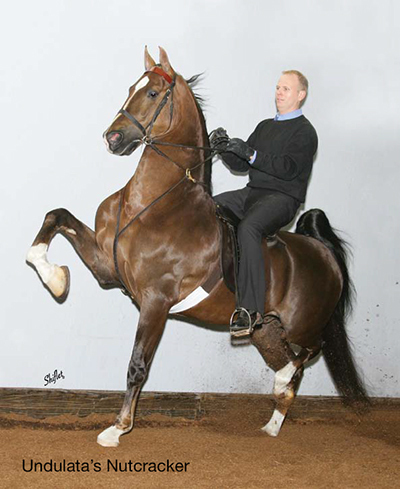 Saddlebred activity in Kentucky, it surprises owner Kit Calafato every single year. Whatever he’s done, she says, he’s done on his own. Kit comes from a Saddlebred background but hadn’t been actively showing or training – and certainly wasn’t looking for a breeding stallion – when she and her husband found The Knight’s Reflection. Though he did show a few times as a baby, being named the Yearling Breeder’s Open Reserve Champion at Louisville in 2006, Kit didn’t have the resources to continue with showing or advertising, but they began breeding him, and the stallion did the rest. dispositions. And they are, quite often, that sought after black color. winning the Missouri Breeders Challenge and the 2-Year-Old Under Saddle class at the Missouri Futurity, but most of the show world was introduced to him when he electrified Kemper Arena with two incredible performances, being named the Three-Gaited Park Stake Champion and Three-Gaited Park Stake Reserve Grand Champion. It is this dazzling, show horse attitude that he passes on to his get. Returning to the list for the eighth year in a row is My Kinda Lovin’. The handsome chestnut is by Time Out For Lovin’ who is from the CH Yorktown lineage, and out of Champagne Frost, by CH Heir To Champagne; he was bred by current owners Brian and Vonal Curran of Wisconsin. My Kinda Lovin’ was a futurity star himself in his early days, winning the American Saddlebred Horse Futurity Of Indiana Amateur Yearlings class and then Amateur Two-Year-Old In-Hand class among other honors, and earning thousands of dollars in prize money. Now, he is producing young horses that do the same. His offspring are receiving both his talent and charisma, and it doesn’t seem to make too much of a difference what mare he’s crossed with – his three top point earning get were all out of different dams, proving his versatility as a sire. All Of The Above made his first appearance on the list in 2012, coming in at #21. He returned the following year to finish with a #15 placing, and this year he made another large jump to slide into the #8 spot. This stallion, it would seem, keeps getting better and better. With just 15 foals on the ground, with his first one in 2011, he’s made a name for himself quickly. His get are following in his footsteps; his three top point earners all won their first time out and won every class they entered this season. He is by Avant, who is by CH Foxfire’s Prophet, and is out of Doubletrees D’Votion, and owned by Don and Allison Deardorff. By Worthy Son and out of Callaway’s Alice Blue Gown by Callaway’s Blue Norther, Once In A Lifetime comes from Saddlebred royalty. His pedigree, which boasts 19 Hall Of Fame broodmares, is evident in everything from his picture-perfect conformation to his talent under saddle. Though many people aren’t aware, Once In A Lifetime was an extremely gifted gaited horse, whose career was cut short by an injury. Since beginning his new full-time profession in the breeding shed, he has been siring offspring with his same talent, intelligence, and great attitude. His get tend to have his same body type, too – size, but size that is conformed nicely – not to mention lots of color. Standing at Skyline Stables for Barbara Goodman Manilow, under the direction of Thomas C. Pettry, Once In A Lifetime came on strong this year with a number of truly exceptional get. He has a crop of promising three-yearolds just beginning training, and many people are very excited for his future as a futurity sire. A Reserve World’s Champion fine harness horse himself, Sir William Robert has long been the sire of champions, and has made both Saddle & Bridle Sire Ratings numerous times, even topping the Performance Sire Rating in 2011. His breeding career spans an entire decade; notable examples of his get include CH Let’s Talk, CH HS Dignitary, CH The Mighty Mouse, and World’s Grand Champion Sir Silver Knight, making it clear that he sires good-thinking horses with “look at me” attitudes, big motors and talent. Owned by C. Thomas Galbreath, Sir William Robert is by Santana’s Charm and out of Rebel Empress by CH Heir To Champagne; one would be hard pressed to find a sire with better lineage. If the past is any indication, Sir William Robert will continue to cement his place in Saddlebred history, and it all starts with his futurity foals.